Season chicken with salt and pepper. Pour olive oil in a large dutch oven over medium heat and begin to brown chicken, working in batches. Brown the chicken, turning once on each side, for about 3 minutes per side. Remove each batch and place it on a separate dish to rest. When chicken is done, add onions and garlic to the pot and saute for 2-3 minutes, until soft. Add pancetta and cook for 2-3 minutes. Add wine and cook until reduced by half. Add stock, tomatoes, beans, and sliced sausage, stirring to combine. Place chicken pieces into mixture and bring to a simmer. Once it's come to a simmer, COVER the dutch oven, and place it in the oven and bake for 30 minutes at 350 degrees. While this is baking, mix together the following: 1/4 cup olive oil (again, next time I'll use far less), 1 cup Parmesan cheese, 1 1/2 cup panko, parsley, salt and pepper. Once the initial 30 minutes is up, remove from the oven. (NOTE: the Williams-Sonoma recipe states to skim any fat off the surface at this point). Now sprinkle the panko mixture on top, covering evenly, then bake UNCOVERED (my one mistake - still turned out delish) for another 30 minutes until the crust is golden and the cassoulet is bubbling on the edges. 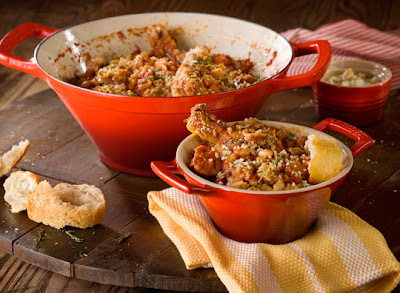 Let the cassoulet stand for 15 minutes before serving. ** The Williams-Sonoma recipe has this cooking even longer...for yet another 30 minutes before putting on the parm/panko mixture, totaling 1.5 hours. But my other recipe I referenced only had it cooking for 1 hour, which I thought was totally suffice. Oh yumm....should have read this before I went to the store!!! Oh, that sounds so very good! Definite comfort food for these cold winter nights! That sounds so good...I am going to make it next week!! Yum! I'll have to try this recipe.